CHILDREN ARE THE ONLY PEOPLE THAT CAN BRING YOU TO THE BRINK - ProudMummy.com the Web's Community for Mums. 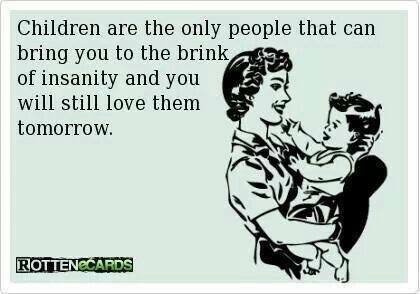 CHILDREN ARE THE ONLY PEOPLE THAT CAN BRING YOU TO THE BRINK OF INSANITY AND YOU WILL STILL LOVE THEM TOMORROW. Yup....and it doesn't matter how old they are! includes grown up children too. Bless their socks!